At Trillium Dental in Ottawa, we strongly advocate for the importance of routine dental cleanings at your local dental office. Professional dental care is a major component of good oral health. We recommend that our patients visit us at least twice per year for a thorough teeth cleaning as well as staying up-to-date with dental X-rays. Our dentists and dental hygienists care about the oral health of our patients, so we put together a list of reasons why dental cleanings are important for your overall health in high hopes that you will continue with regular maintenance visits at one of our convenient locations. Here’s how it works! Plaque is a sticky, bacteria-filled deposit that naturally builds up along your gum line as you eat, drink, and go about your daily life. Plaque and tartar have the potential to eat away at your tooth enamel and create cavities if it isn’t removed via regular brushing and flossing. Given that plaque is nearly invisible, even those with impeccable oral hygiene habits have a hard time eliminating all of it when they brush and floss their teeth. Over time, this plaque buildup turns to tartar — a calcified version that requires professional removal with the appropriate dental tools and techniques. This is where teeth cleanings at your dental office come in. During a professional teeth cleaning, your dental hygienist will perform tooth scaling or use the Cavitron® to clean beneath your gums before moving on to polishing, flossing, and taking dental X-rays (if necessary). Tooth scaling is the process of using instruments (scalers) to gently scrape the plaque and tartar buildup from along your gum line. Since tartar removal requires the work of an experienced hygienist, it is critical that you schedule a dental cleaning at your dental office at least twice per year. This way there is a far less risk of developing cavities and suffering from other painful consequences of poor oral health. In addition to developing cavities as a result of plaque and tartar buildup, neglecting to have your teeth cleaned at your dental clinic twice per year also puts you at a greater risk of developing gingivitis and moderate- to late-stage gum disease. Persistent tartar buildup along the gum line is one of the main causes of gum disease. As the bacteria binds and hardens to your teeth, the surrounding gums can become inflamed and irritated. This can cause periodontal pockets below the gumline, where bacteria can grow and fester (creating deeper and more extensive pocketing and eventually lead to bone loss). People with gingivitis, or early-stage gum disease, will notice their gums swelling, bleeding, and receding. Luckily, gingivitis can be preventable with good oral health practices at home and regular dental cleanings. In some cases, gingivitis can be reversed if treated soon enough by your dentist. If left unaddressed, however, gingivitis can evolve into more severe cases of periodontal disease; an oral condition that can lead to bone loss, gum recession and tooth extraction. When significant portions of tooth structure are compromised, decayed, or lost, crowns, dentures and implants are the best option for replacement. People who suffer from gum disease also put themselves at a higher risk of developing heart disease, diabetes, and stroke than those who regularly have their teeth cleaned at the dentist, as bacteria can easily enter the bloodstream through bleeding gums. To avoid developing gingivitis or periodontal disease, simply maintain good oral hygiene habits, like brushing and flossing at least twice per day, refraining from smoking cigarettes, and making sure to visit your dentist on a biannual basis for professional dental cleanings. Trust us — neglecting to schedule teeth cleanings at the dentist just isn’t worth the pain of gum disease or putting your life at risk. 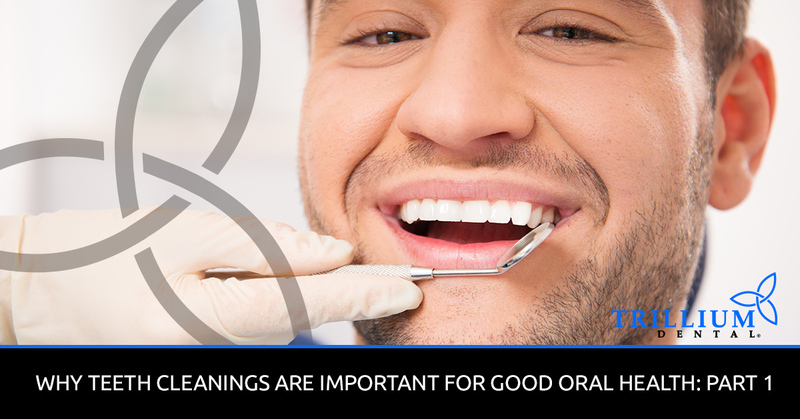 We hope this post has proven helpful for understanding why dental cleanings are important for good oral health, and that you will stay tuned for part two of this blog series in coming weeks. There are many other benefits of having your teeth professionally cleaned at the dentist, which we are eager to share with you. At Trillium Dental, your oral health is our highest priority, and we look forward to seeing you at our dental office for a routine teeth cleaning. If your pearly whites are in need of a professional cleaning, schedule an appointment with us today!